Our brand new clear gloss Spray Lacquer has been formulated to be strong and flexible. 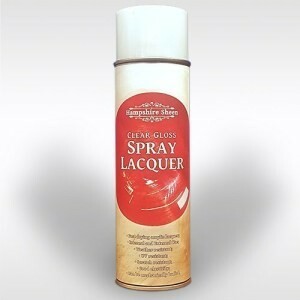 It can be used for both internal and external projects, and is best used on decorative items. Fast drying and high gloss; Use on metal and other media; Weather resistant, light proof and UV resistant; Scratch and impact resistant; Excellent surface hardness and good elasticity. Perfect for wood projects; Can be mechanically buffed. Each 500ml can comes with two nozzles – one with a flat spray pattern, and the other has a round spray pattern. Related links to "Gloss spray"
Customer evaluation for "Gloss spray"